REALESTS NCAA College Michigan Football Basketball Rich Rodriguez Lil Wayne DMX: YOU BASTARDS!!!!!!! Why did no one give us a heads up about this?! Two years after saving Gunston from annihilation, George Mason has once again decided to discontinue the loveable furball. It's like some kind of doggy genocide going on over there in Fairfax. This is the same school that once praised him, citing his "out-of-this-world dance moves and enthusiasm for Mason Athletics, Gunston is the Patriots' most recognized and biggest fan, soaking in all of what George Mason University has to offer." Spare us your PR machine. We know, and his 5,000 Facebook friends know, you're putting the dirty mutt to sleep. 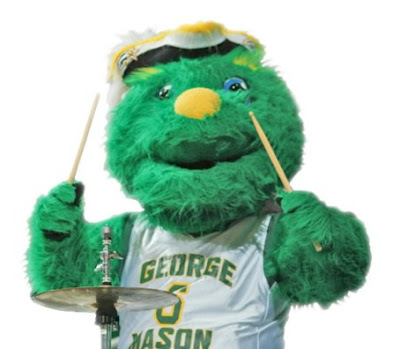 We can only hope the person in possession of the costume has enough balls to show at Mason's home opener in character with a noose around his neck and constantly give the new mascot the slit-throat from the student section. And we're once again calling on Realests Nation to take a stand. We already saved him once. How hard could it be the second time?